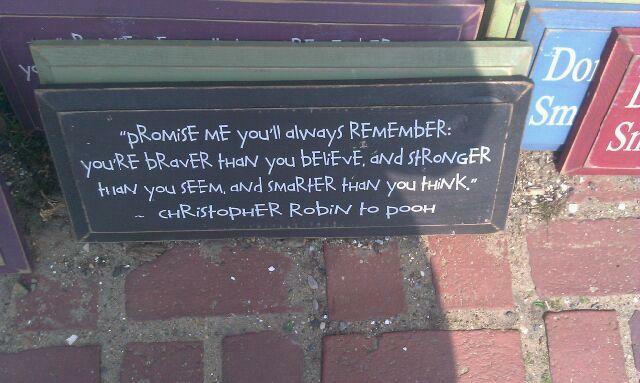 Oh, Christopher Robin - such encouraging words! As true children of God, we can hear our Father saying this to us. He can say this because His Spirit lives inside of us. His Spirit can dwell inside because of the blood that Jesus Christ shed for the world. This is so exciting! No matter who you were or are today, if you confess with your mouth and believe in your heart that Jesus Christ is Lord, it means that HE + You = The Majority. It means No Weapon Formed Against You Will Prosper. It means When You Are Weak He Is Strong. It means When You Lack Wisdom You Can Ask God & It Will Be Given To You. Many more promises for His children can be found in His Word, the bible. Try this, it's pretty cool! Virtuous Journey, 2016. Powered by Blogger.